I used to hike a lot. Long hikes. Hard hikes. Peaks. Cross country. Forests and mountains. Now it's only on occasion. Last few hikes I did, I stumbled about gracelessly, the ground feeling foreign. My feet were out of practice, my body uncoordinated. I must get my hiking legs back underneath me. 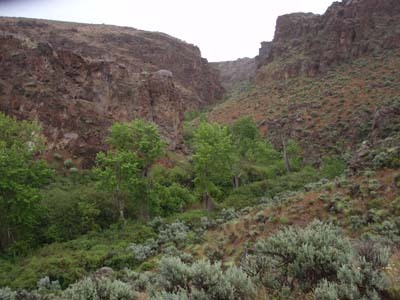 Today I head cross country in the Owyhee desert to the Deep Red Canyon of the Hart. 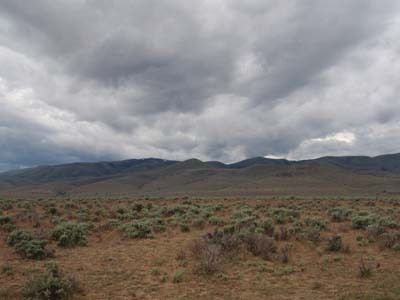 The skies are dark, blue-gray and heavy; the rain is moving down from the Owyhees. It begins to fall on the desert, on me, first a soft mist. Then I hear the sound of drumbeats all around me. Then I feel the drumbeats. 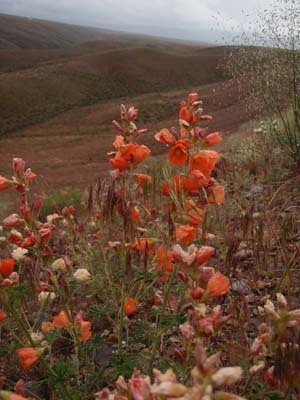 The earth turns dark, glistening; the flowers emanate intense hues - the Indian paintbrush, purple sage, wild onion, buckwheat, penstemmon, globemallow, lupine. The earth gets wet. My skin gets wet. The flowers reach skyward and drip raindrops. I turn my head skyward and rain drips from my face. Today my feet are feeling the earth, molding to the uneven ground, moving over it without tripping, without slipping on the wet rocks. 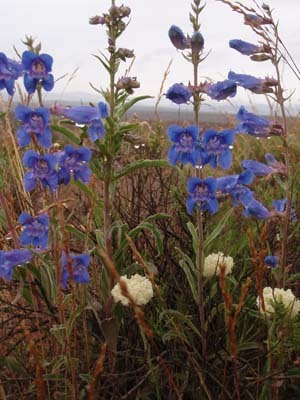 I smell the wet desert, the sweet sage and flowers of the shadscale. I absorb the rain like the desert. 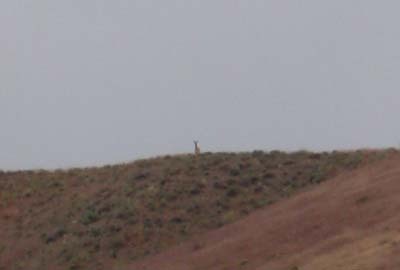 Today it's just me an a lone pronghorn on a ridge in the distance. We study each other. I have binoculars. He has the speed with which to disappear. It takes me half an hour to reach where he was. 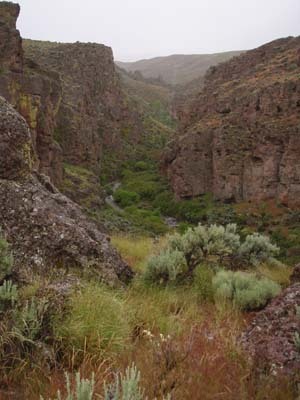 Before I see the cliffs of the Deep Red Canyon, I hear the roaring waterfalls on Hart Creek far below. 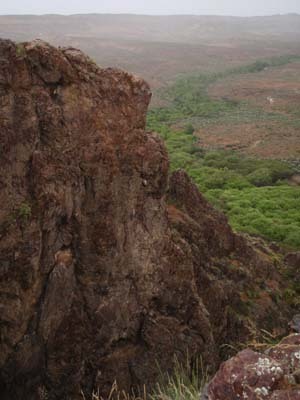 The cliffs are red and gray in the rain. Tall. 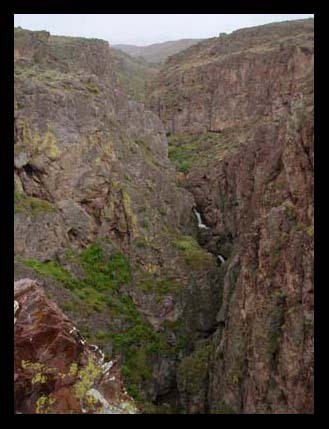 I can't see the bottom of the canyon. Slippery. I don't get too close to the edge today. They rise abruptly from the wide valley floor to become a deep chasm. Two empty eagle nests perch on the face of the cliffs. Pigeons fly about in confusion at this rare human intrusion. Canyon wrens sing their melodic downward spiraling tune. 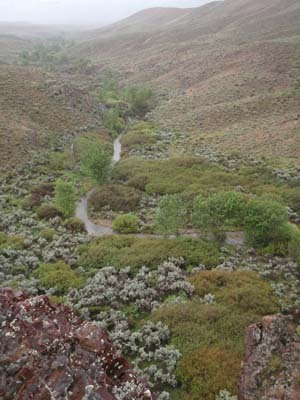 the rhyolite rock carved and sliced over eons by water running down from the Owyhee mountains. 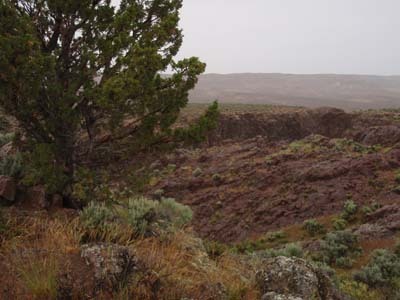 A lone juniper stands guard over the canyon walls. I stand beside it, dumbfounded by its perpetual view. My feet find and follow a game trail down into the canyon. I startle a prairie falcon. It flies away, perturbed, screeching at me. 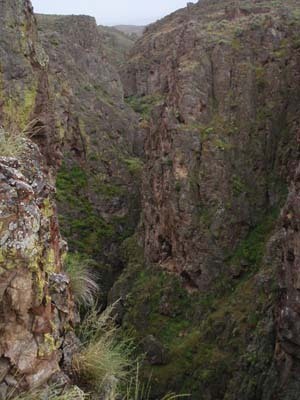 A lush ecosystem crowds this narrow canyon. Fat cottonwood trees squeeze alongside the creek. They are thick with luxuriant leaves. Willows choke the ground. Bouquets of rice grass reach my waist. 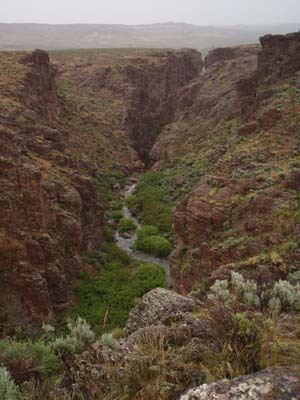 I climb back up to the canyon rim and follow it until the high cliffs meld into the soft hills that cover the Owyhee desert, and hide these marvelous canyons. 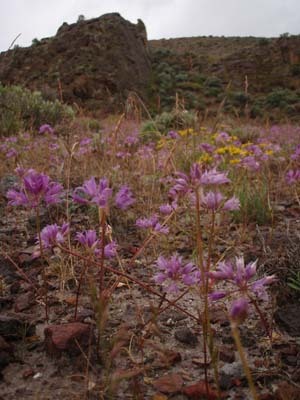 The flamboyant wildflowers line my return path with a royal carpet. 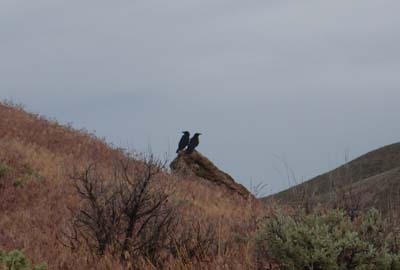 Three baby ravens screech and squawk until I climb a hill to see them. They sit silently and study me then discuss among themselves my place in their desert. I have my hiking legs back under me today. I think the Ravens approve.